Blogging is all about connecting and sharing with others what we love and feel passionate about. While I'm hoping to improve how I share my passion about life on the farm with writing tips and techniques, I can't wait to connect with other women that have been sharing their creativity and passion so well on a variety of blog subjects! Although I will be stepping out of my dairy farm comfort zone, I will be stepping into a pair of beautiful boots--compliments of Country Outfitter,one of the fun and generous conference sponsors (http://countryoutfitter.com/?utm_campaign=Sponsorship_Post_AWBU_2012_07_24_). How did they know I have a passion for boots! With so many boots to choose from, it was not an easy decision. 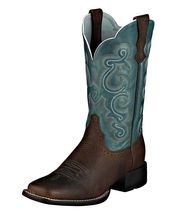 What I really love is that not only do I get a pair of boots for attending the conference, Country Outfitter is donating a pair for me to give away on my blog after the conference!! Don't worry, I'll be sure and get the giveaway instructions so that one of ya'll can be the proud owner of a new pair of boots,too! If you're curious about other fantastic sponsors of this event and what happens at a "meet-up" of bloggers, you can check the conference agenda at http://arkansaswomenbloggers.com. Thanks--and don't forget to watch for the upcoming boot giveaway!